Nice mix there. I have to say that's the way to go - several subjects at once. 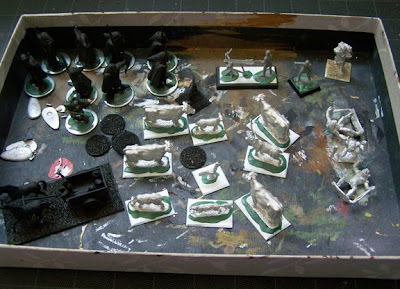 I have used the shoebox method to take stuff to work to paint. You painted at work? Where did you work? Yes, I always have multiple hobby projects going on at the same time. I guess it keeps me from getting burned out on any one particular genre. I do phone-based customer service work. Not a gran career by any means but it pays bills and provides excellent benefits for my family. My wife is the professional in the family. I really need to start making a pact to at least do a little work on something hobbyish at least once a day. Even ten minutes worth of painting is better than none.